Our words define our actions…and often the actions of others. I can’t tell you how many times I’ve heard ‘They can’t have that treatment, their insurance doesn’t cover it’. In this week’s Quick Video Tip I’ll share some ideas on how to overcome this limiting belief and find the courage to share the best treatment with your patients and let THEM decide. Do you ever wonder why it is so hard for some of us to accept and embrace change and for others it appears to be effortless and almost inviting? What makes a person stare change in the face with a smile while others of us gnash our teeth and glare at the suggestion of even trying something different? 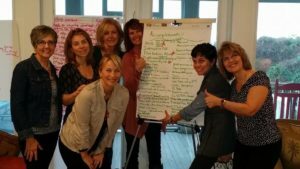 See how one large team of 16 (5 hygienists) had the courage that it took to make great changes for the health of their patients and team through learning how to “speak the same language” with effective communication! Pre Coaching Oct. – Dec.
Should we study the past to create the future? You’ve likely already read a dozen articles about starting your year off right, about putting 2014 behind you and starting strong. But looking back can actually give us the courage to move forward. Sometimes the past can be painful. I certainly had some painful moments in 2014 both personally and professionally. Did you? And do those scary times ever make you a little nervous to take the same chance in the future? 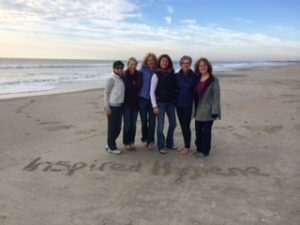 In early December I hosted our annual IH team retreat. This year, instead of hotels and boardrooms, we decided to hit the beach. We rented a beach house on the South Carolina coast and what transpired was so special. One of our special guests was Katherine Eitel, creator of The Lioness Principle and a dear friend and mentor. Katherine taught us how to deepen our team communication and trust. 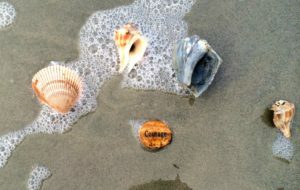 On one of our morning beach walks we found some amazing treasures-seashells, sand dollars, starfish and…a COURAGE rock. Yep, right there on the sand was this message for us. To step into the 2015 version of our best self, let’s take a look back. Read below for a few quick tips on how looking back can build your courage to do amazing things this year. Want to make some major, positive changes this year in your practice? Whether that change is expanding your team, leaving your practice, adding new services, updating protocols…it’s all change. First take a look back. Even before you start setting goals, take a look back at what you accomplished last year. I’m not just talking about the big wins but also all the little things. What about the hard things? The things you never thought you would do. Here’s an exercise to bring to your first team meeting in 2015. The IH team has studied closely with Katherine Eitel and this exercise she taught us, we do with ALL of our client teams. We did this together at our retreat in December. What we came up with was amazing! We literally had over 100 accomplishments. Last year was interesting for us. It wasn’t our biggest year ever. It wasn’t the easiest year ever but WOW, did we accomplish a lot and grow and learn. And THAT gives me courage to move forward. We have some BIG stuff in store for 2015! Some really cool new partnerships and opportunities that we’ll share with you. Like you, it takes courage to step into the next big place. But looking back makes us courageous TOGETHER! Are all your hygienists speaking the same language? All of us here at Inspired Hygiene would like to wish you a very Happy and Prosperous New Year! As we do every year, the IH Team assembled for a week-long training and planning meeting in December. This time, we all met up in Charleston, SC to share a big house right on the beach. We teamed up and you might say we had a ‘cook off’; as it turns out, we all have great talent in the kitchen. The menu ranged from homemade egg flower soup and fluffy egg casserole to shrimp and grits and some amazing kabobs. We participated in team learning activities, curriculum development and planning for a fantastic 2015! We are very excited to have each of you; our valuable clients, friends and colleagues share this New Year with us! This year will see the launch of our brand new hands on courses and doctor discovery days! Stay tuned for more information. At the close of our meetings, we are always reminded of just how powerful and productive a meeting can be when everyone is on the same page and has the same goal in mind. Doctors, Hygienists and Office Managers alike, frequently ask us how to keep the momentum and enthusiasm of training alive. The answer is powerful and productive monthly Hygiene meetings! And here’s the good news, our New Year’s Gift to you, you won’t have to plan any of these meetings. We’ve done that for you! You might remember last year we launched our first ‘12 Months of Hygiene Meetings’ system. This year we’ve updated it to help you keep those monthly hygiene meetings interactive and productive. Rachel and I invite you to join us for the Mastermind Call this month where we will be discussing how to get the most out of your Hygiene Team Meetings. You don’t want to miss it. “I don’t know what happened? We used to do that! …from a team member or doctor when it comes to a protocol or system that you had in place, but is no longer being followed? Believe it or not, our best intention to keep protocols in place is not always enough. 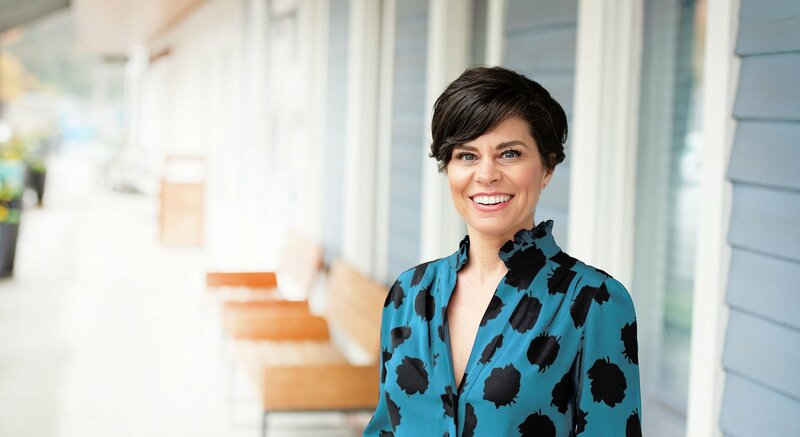 It’s in the best interest of your patients, your team and yourself to set aside specific time on a monthly basis to review and tune up your protocols, while refining your treatment and clinical philosophy. It’s essential that all wheels on the bus are turning in the same direction. During this call, Rachel and Kim will discuss tried and true ways to help you keep your Hygiene Department on track to reach your goals and benchmarks during the New Year! This call will be available in our Mastermind Library on January 15. If you’re not already a member of our Mastermind group, Click here to sign up. 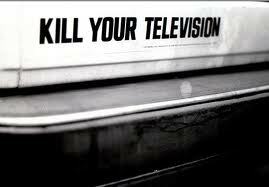 If you lived in a college town in the 90s like I did, you may remember the bumper sticker ‘Kill Your Television’. I’m reminded of it every time I walk into a dental practice and see a TV on in the operatory. Notice I said TV, not monitor. There’s a big difference. Having traveled all across the country, I’ve seen a lot when it comes to what’s being broadcast in some dental offices. From depressing commentary on the local economy to trashy talk shows to HGTV to graphic images of murder victims, I’ve seen each and every one of these shows blaring in dental operatories occupied by patients who came there to be cared for. I know, I’m getting preachy here but I just can’t help it. Recently when I visited a lovely client whose ops are completely equipped with digital x-rays and intra-oral cameras I saw this in play. I cringed every time I heard the hygienists giving it their all to engage the patients in the hygiene exam only to see the patient’s gaze locked not on their care giver but rather on the local morning show.